Rioja is without a doubt Spain’s best known wine name. As a full-bodied, but always easy to drink (and pronounce) red wine it is a favourite of many. But Rioja is also a wine and a region that has changed significantly over recent decades, with new styles of Rioja evolving and the once very traditional region becoming a showcase for some of the most stunning and innovative, modern wineries in the world. 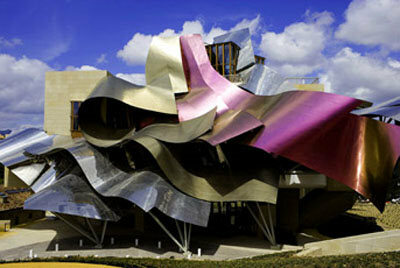 Right: Marques de Riscal. 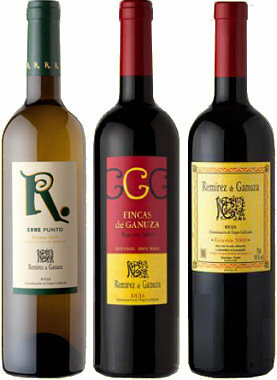 The ‘Old Rioja’ was a very mellow, pale-coloured wine, aged for very long periods in old American oak barrels. The revolution has seen a move away from this style to wines with much more concentrated fruit and ageing for less time, mostly in newer French oak. Change has touched even the region’s most historic houses like Marques de Riscal and La Rioja Alta, but there has been an influx of new and ambitious Rioja names too, helping to create the ‘New Rioja’. Some of these, like Bodegas Valdemar for example, were established grape growers who made the switch to making and bottling wine. Others like Bodegas Baigorri are 21st century ‘start-ups’. UK importer and retailer Bancroft Wines has just taken on UK distribution for another relatively new and much lauded Rioja estate called Remírez de Ganuza. Founded in 1989 by Fernando Remírez de Ganuza, who had previously been the largest vineyard broker in the region, Remírez de Ganuza now owns 80 hectares of its own prime vineyard land across Rioja, in over 100 different sites. Stockists include Berry Bros. & Rudd and Hedonism Wines. This serious white Rioja is a blend of 70% Viura 30% Malvasia, fermented and aged seven months in all new French oak barriques. It has a lemony/straw colour, and a nose that is at first quite muted, giving lemon rind and a touch of apple, just a little butter and vanilla from the oak, and a subtle floral fragrance emerging. The sweetness and intensity of fruit explodes onto the palate: masses of ripe, sweet orchard fruits, with a nicely weighty, viscous texture and taut core of acidity. There is real concentration here, that almost tannin-like grip of concentration, fruit and acidity giving length and shimmering structure. This is a powerful white wine without a doubt, though the 13.5% alcohol is moderate, and would surely have a little ageing potential to allow that latent waxiness and honey to emerge. 91/100. £22.40, see all stockists on wine-searcher. From slightly younger (but still 25- to 40-year-old) vines this is 90% Tempranillo and 10% Graciano, aged for 26 months in new oak, 80% French and 20% American. It has a dense ruby colour, and the nose is delightfully rich, deep and seductive with copious red and black fruit compote notes, a polished sheen of oak and some nicely pitched gravel and earth savour. On the palate it is a powerful and substantial wine, the concentration of fruit is obvious, grippy and tart with plum and cherry skin grippiness to the fruit and acidity. Tannins are also fairly beefy at this stage, though they are refined. The wine finishes on that matière, with real intensity. 93/100. £34.15, see all stockists on wine-searcher. From 60-year-old vineyards, a blend of hand-selected Tempranillo, with 10% Graciano. It was aged for 24 months in new oak barrels, 80% French and 20% American. The colour is a deep, saturated dark ruby, and the nose has an immediate sense of concentration and richness. Tobacco and fine, peppery spice, and something quite mineral too over deep-set but sweet and ripe black berries. Just a hint of cedar and something gamy adds a lovely touch of extra complexity. In the mouth it has massive presence: there is the concentration of the cassis and black plum fruit that is dense and sweet, a big chocolate-infused layer of wood smoke, and those complex spice and savoury, clove and cinnamon-like notes. Very powerful stuff, very striking and intense, the finish is long, spices tingling on the lips as the sweet fruit persists. A big wine with 14.5% alcohol, but it has real energy in its intensity, the firm core of supple tannin and the cherry-skin edge of its acidity. Very serious and no doubt worthy of considerable cellaring. 94/100. £61.35, see all stockists on wine-searcher.